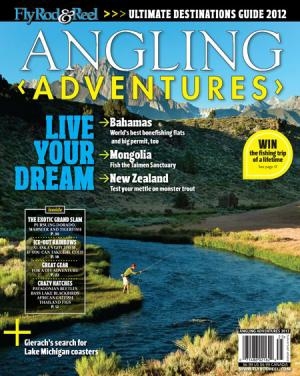 This article originally ran in the Angling Adventures 2012 issue of Fly Rod & Reel Magazine. All of us dream of adventure—the three-day float deep into a map where the only pathways are rivers and game trails. But to pull it off, you have to be properly equipped. A few years back, I spent the most uncomfortable night of my life camped on a solid sheet of ice in sub-freezing temperatures next to a trout stream in Arkansas. It was February, and yet I had only a thin-wall tent, no stove, and a cheap sleeping bag that in no way deserved its 20-degree rating. That trip illustrated just how important quality gear can be—especially when you’re miles from the car, in places where the weather can be a touch unpredictable. Say you were planning a solo trip into the backcountry of Yellowstone, in September or October (when the browns are migrating for their spawn and daily highs can be 75 degrees, but the nights are in the 20s or colder). You could hoof it, but hiking usually requires some serious compromises in the amount of gear you can bring and how much time you spend fishing versus getting from spot to spot. 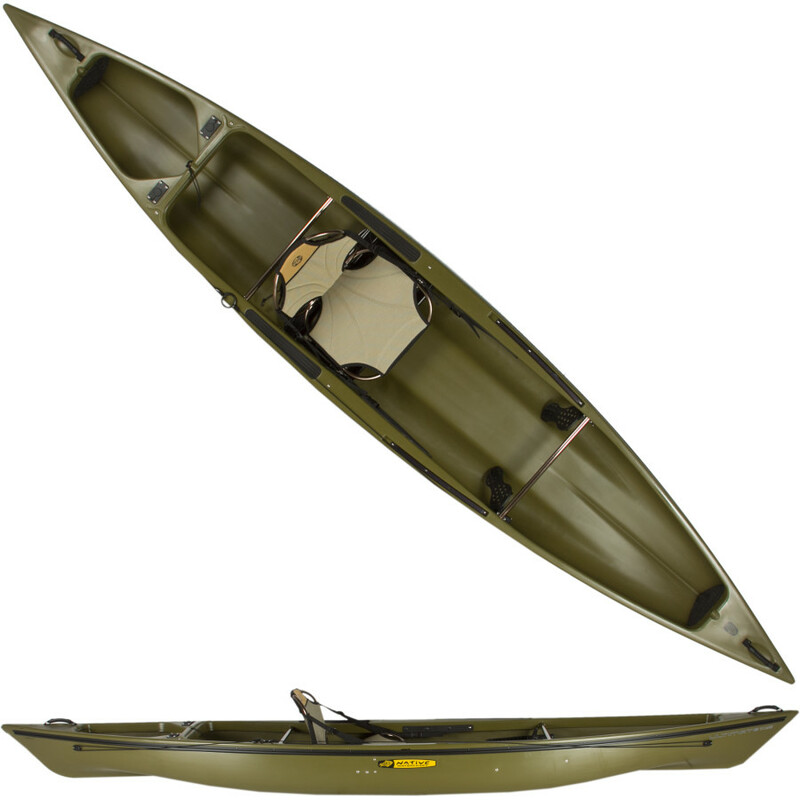 A better option for many anglers would be to bring a one-man boat, like the Native Ultimate 14.5 Solo Angler kayak ($1,149; www.nativewatercraft.com). The absence of a deck on top of the boat leaves plenty of room for gear, and the tunnel hull makes the boat more than stable enough to fish out of while standing up. You could easily solo the backcountry for a week out of this craft. You’ll need shelter. This is a good area to save some space in the boat, especially if you’re bringing a quality sleeping bag. NEMO Equipment was founded by an MIT engineering student and was the first tent company to offer air-supported pole-less tents. Their Moto 1P tent ($349; www.nemoequipment.com) weighs less than three pounds, and is held up by an inflatable archway that provides 37 inches of headspace—enough room to sit up inside to read a book in the event of a snap rain shower. 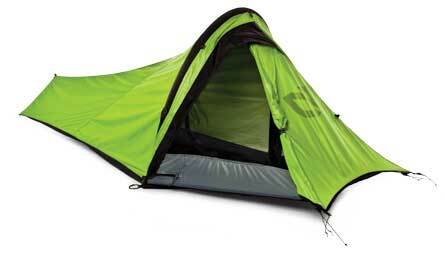 With an integrated pump, the tent stands up in about 30 seconds and yet remains ultra-compact. The watertight stuff sack is perfect for boat-based camping, letting you save precious dry bag space for clothes and electronics. Any single-wall tent is a compromise, of course, and that’s why you’d be smart to overkill on the sleeping bag. 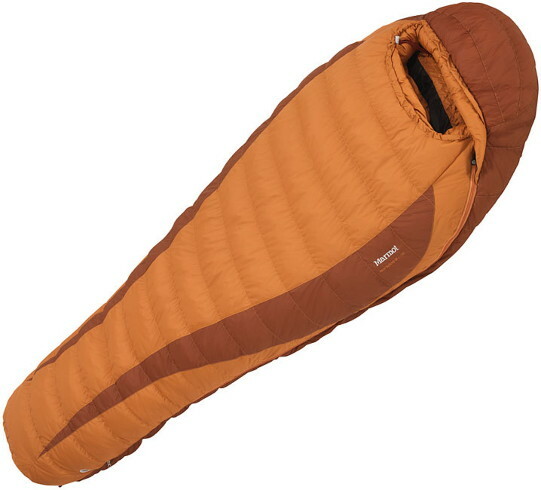 Marmot’s hefty down Never Summer sleeping bag ($319 for base model, $369 with waterproof MemBrain exterior; www.marmot.com) offers comfort to temperatures of 20 degrees, with survive-the-night protection down to zero. (The rating system for sleeping bags is somewhat deceptive: a “zero-degree bag” in marketing lingo simply means the bag will keep you alive at zero degrees Fahrenheit. For comfortable sleeping, you should typically add at least 20 degrees to the rating on the label, and more for cheaper synthetic-loft bags.) The MemBrain version of the Never Summer incorporates a microporous membrane, just like a technical jacket, meaning if you don’t mind a few bugs you could skip the tent altogether and still wake up dry. Paired with the ThermaRest NeoAir sleeping pad ($140; www.cascadedesigns.com/thermarest), which packs down to the size of a one-liter bottle while also offering two legitimate inches of loft when inflated, you’ll not only be toasty in a snowstorm, you’ll even be able to sleep on your side. Another versatile, albeit unconventional, option for dry storage would be to simply bring a cooler. Two cooler companies offer heavy-duty models that are designed to keep ice for five days. The Yeti Tundra series (available in a wide range of sizes; I think the most practical for boat camping are the 35- and 45-quart models; www.yeticoolers.com) has 2½” of foam insulation and doubles as a certified bear-proof container with optional padlocks (yes, padlocks). You could store a week’s worth of dry food inside, or just bring ice to chill the trout you catch (adventures don’t always accommodate strict catch-and-release). At $259 for the Tundra 35 and $299 for the Tundra 45, these coolers are admittedly luxury items. Meanwhile, Brute Outdoors is now offering a line of Brute Box coolers that have many of the same features as the Yeti (2 ¼” of foam, heavy duty construction, availability as a dry storage chest) for around $100 to $130 less for an equivalent model. 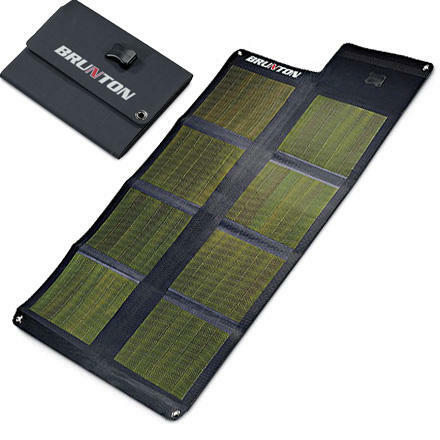 You lose the bear-proof certification, and the smallest Brute Box is currently a 55-quart model (best for canoe camping), but the cost savings are significant (the Brute Box Cub 55 is $199; www.bruteoutdoors.com). Incidentally, all these coolers double as spectacular poling platforms should the need arise. You can’t go camping without doing some cooking, but with space at a premium you’ll need to leave the cast-iron pots and pans at home. Fortunately, camp-stove technology has come a long way in the past few years. MSR’s excellent Pocket Rocket ($39; www.cascadedesigns.com/msr) breaks down to the size of a salt shaker and yet can support a fully loaded pot of soup for two mounted atop its fuel tank. It takes standard camp-stove fuel, with the smallest available canisters good for at least three days of meals at about five bucks a pop. 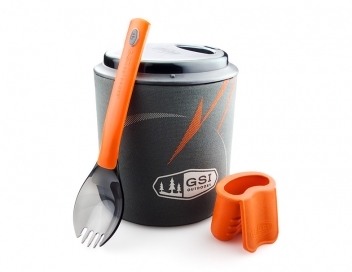 For pots, GSI’s Halulite Minimalist ($28; www.gsioutdoors.com) is a durable and versatile option for everything from coffee and ramen noodles to trout stew. If you’re going to be cooking for more than one person, the Bugaboo Backpacker kit ($69) gives you just about everything you’d need to prepare a three-course streamside banquet. Of course there is always the risk that one’s fishing efforts will not result in protein, and man cannot live on ramen noodles alone. For backup, check out Clif Bars’ lineup of organic, protein-packed energy bars ($13 for a box of 12; www.clifbars.com). The Coconut Chocolate Chip recipe is especially delicious, and one bar provides 18 percent of your daily protein needs. Water sterilization is also a constant concern; while you can, of course, boil your fluids, we don’t always have time to break out the camp stove. The SteriPEN water purification system (available in a wide variety of models from $50 to $100; www.steripen.com) blasts organic microbes with UV light. It is even effective against giardia, the West’s most insidious water-borne pathogen. Simply stick the thermometer-like device in your bottle of creek water and nuke it while stirring until the indicator light flashes off (the whole process generally takes less than a minute). While it won’t change the “flavor of nature,” you can rest assured that you won’t be visiting a doctor any time soon. 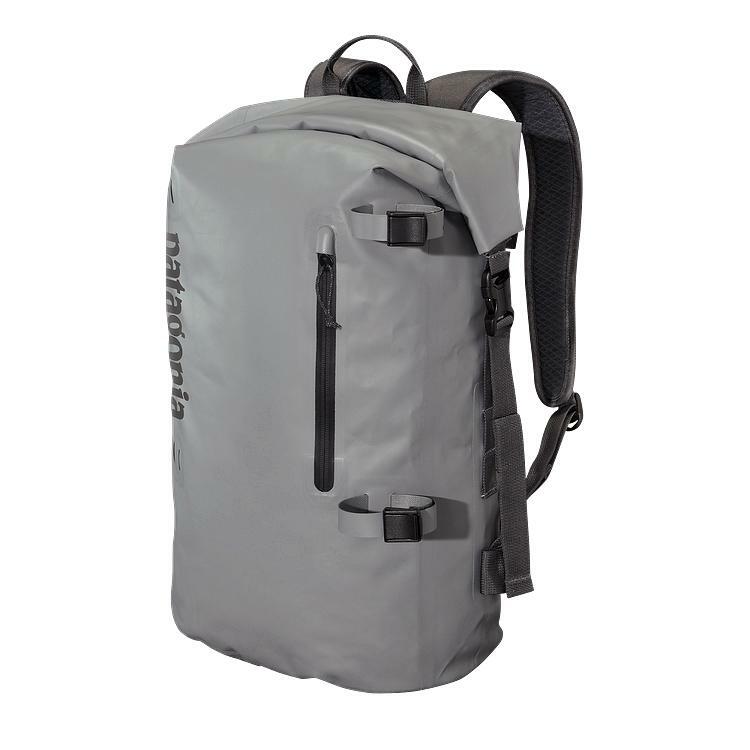 Outdoor gear has come far in the past 10 years. Gone are the bulky canvas tents and depressing, deflated pads of yesteryear. With comfortable shelter, warm, soft beds, quality food and a wide variety of electronic support options, we can now be just as much at home deep in the bush as we are on our favorite trout stream 50 feet from the car. Good gear makes all the difference in the level of enjoyment we derive from a truly adventurous trip. So what are you waiting for? Grab a pack, load up the car and head out!